Bashful Blonde: Great for light blondes preferring golden tones in the eyebrow area, and one of our most popular colors for blondes. 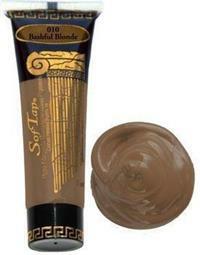 You can lighten this color by adding Golden Sunrise, or cool it with a light color from the SofTap Cool Collection. SofTap pigments are a thick creamy consistency that are excellent for use with manual tools and Microblading. Each tube of SofTap "Bashful Blond" Pigment comes in a 7ml. size.